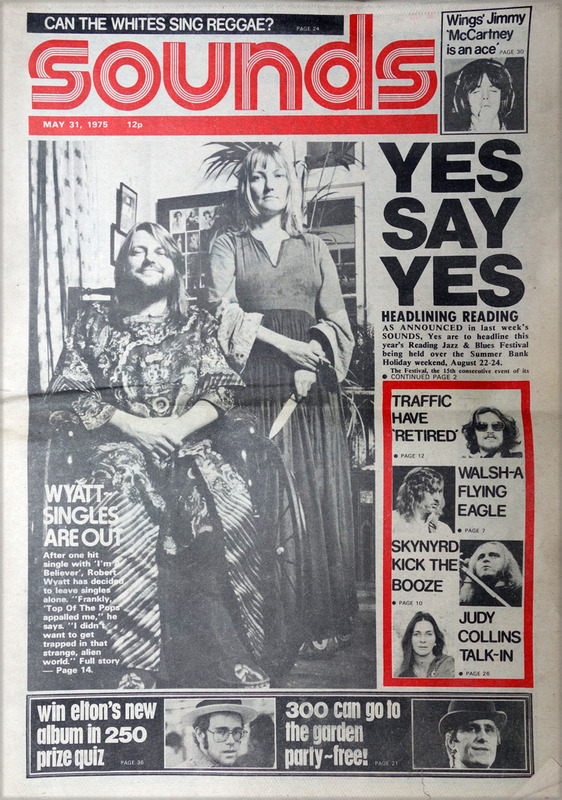 YOUR NAME is Robert Wyatt and your 'comeback' album was hailed as everything from a triumph to a master-piece by critics the length and breadth of the land. It was an uncompromising sort of album called 'Rock Bottom'. You had brewed it for months, if not years, and it had turned out right. People assumed that this was the way you had decided to go in the future, but you are far from sure. Since that album, you also released a single, a version of the Monkees' hit 'I'm A Believer': it was a modest hit for you. You recorded a follow up — a heavily re-worked version of Chris Andrew's 'Yesterday Man" - but decided not to release it. It came out on a sampler album. YOU STARTER for ten is this: do you confess to not having a new tune to your name and ask Dave Edmunds produce the album? Or do you ring up a bunch of friends who you think might sound nice if persuaded to play together, and see what happens? Discuss. 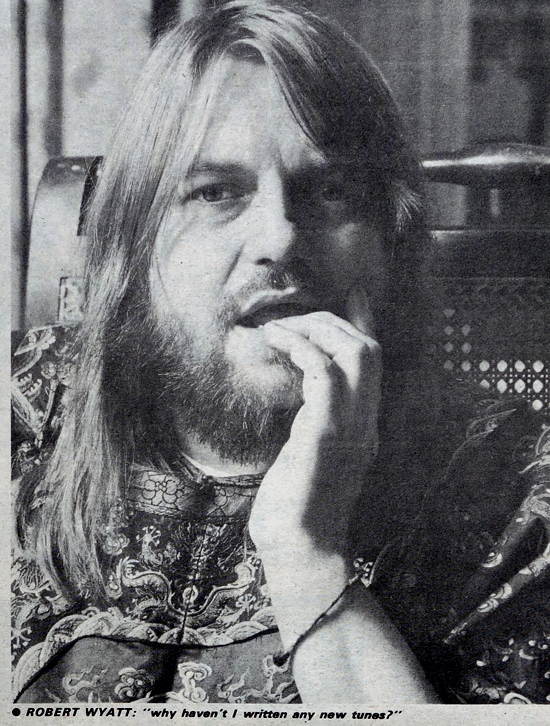 "WE EVOLVED an interesting variation on Eno's Oblique Strategies," says Robert Wyatt. (We've converted this to an oral examination.) "Things like you go and make the tea", he indicates Bill MacCormick across the room, "and we'll turn the bass up two dbs". But, says McCormick, they ratted on the deal: they didn't use that take. The interviewer then switches on his infernal machine and remembers he hasn't got a first question. He confesses this. 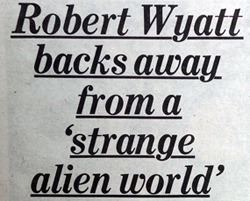 Wyatt obligingly begins to interview himself: "Why haven't I written any new tunes? It's a long story. Shall I admit that I can't think of any? Yes. Hmmm." Cut. TAKE TWO: Was he frightened at the thought of having to commit some music to tape again, in the wake of critical and public reaction to 'Rock Bottom'? Long pause. "Yes ... very." Long pause. "I suppose if I took trouble to do anything with this one," he is talking of 'Ruth Is Stranger Than Richard', the new album. "it was to make sure that it wasn't really related to what had gone before. I deliberately did some things and made some noises that I wouldn't have done on 'Rock Bottom' because they would have been inconsistent. In other words, I didn't worry about consistency from track to track on this one. I think more than ever before I just did each track as a separate thing." How did he get together the musicians for the album? "Quite simple — it took about 10 minutes on the telephone." The people were Fred Frith (not Fripp), Bill MacGormick, Nisar Ahmed (George) Khan, Gary Windo (not Window), Laurie Allan, Brian Eno and (for 'Sonia' only) John Greaves and Mongezi Feza. 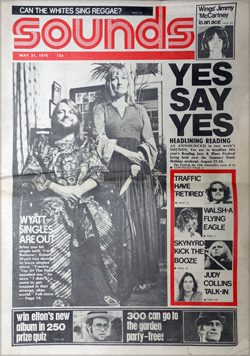 'Sonia' was recorded as the B-side of 'Yesterday Man' and Robert's secret hope was that it would get flipped over and become the 'Green Onions' or the 'Let There Be Drums' of the Seventies. Mongezi Feza - Superstar! "It was more or less a question (this is for the album sessions at the Manor) of getting together four or five musicians who I liked the playing of ... I suppose I could have done 'Rock Bottom Parts Two and Three ..."
But that's hardly the point. "That whole thing that surrounded 'Rock Bottom' about 'he's found a new way of working", just isn't the case. I haven't found a new working system. I haven't got back into anything. 'Rock Bottom' included a lot of old material. Probably having had the pressure off for so long allowed stuff to accumulate." And even that's not really the point. 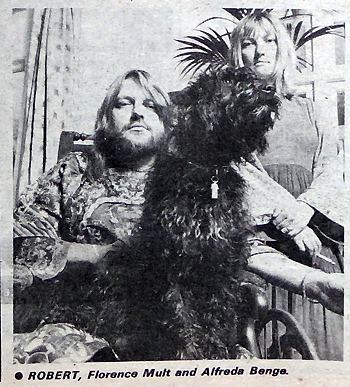 What makes Robert Wyatt go, into the studio to make a record? In brief paraphrase, he looks around his record collection, decides what, he'd like to hear and if the record doesn't yet exist then he goes in and tries to make it. That's also oversimplification. 'Ruth Is Stranger Than Richard" started life as Robert's desire for a record by "a-mid Fifties middle-of-the-road modern jazz group with great big booting tenor solos". It developed from that, of course. If that explanation sounds — how you say? — a trifle glib, then let's ask if the pressure of other people's expectations frightens him a little bit. "What's happened is that I've stopped writing because the things I would write naturally aren't necessarily the kind of things I'd want to listen to." And he makes records be-cause- he wants to listen to them. "I am very caustic about the things other people do, but I'm also pretty caustic about my own things in the sense that a lot of the things I could do I won't do because there doesn't seem any point in doing them just because I can - I feel it's not worth it. I find the idea of just going on and on making noises just because that's your job pretty alarming ... and undignified. "I think of lots of things, but I only write a tune if it seems absolutely necessary — I won't write it unless it seems quite obvious that no-one else is going to do it. But ideas circulate in a community, and you usually find if you get an idea and don't do anything about it, then someone else will. "It's just a feeling that if I did just pour out what comes naturally to me, then it would be all right but nothing special — the things that I'd really be proud of myself for doing are beyond my reach. I just wait for the tings I feel I have to do, and then rush to a tape recorder..."
Yes, yes but wait a minute: how does "I'm A Believer" fit into all this? Part one, it was fun; part two he was asked to do it my Simon Draper at Virgin; and part three he was interested in tinkering about with the inside works of a standard pop song: "to find out how people are able to write things that last three and a half minutes and are complete miniatures... it's some thing I've never been able to do - I either write things that last a minute or they're long. I've since discovered that all pop songs only last a minute and what they do is play them two and a half times, and the second time round they put in a guitar solo. Only I did it wrong and had a violin solo." 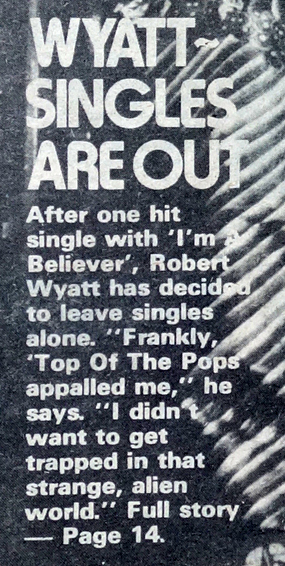 But after getting onto the chart with 'I'm A Believer" and experiencing the world of 45rpm records at close quarters, he decided to withdraw to the red corner. "Frankly, Top Of The Pop appalled me, and the different things that are expected of you in situations like tha... it's the singles world really, the business thing. People say this has to be changed, or that has to be changed because so and so won't play it. The rules are so strict, and I just haven't got the necessary humility or whatever to fit into that. I could see it becoming what I did — I would make singles — and I didn't want that to happen. I didn't want to get trapped in that strange, alien world. "And then, the other thing was people telling me to put rubbish on the B side in case it detracted from interest in the A side. Apparently, that's quite a common thing, but to me that's the Unacceptable Face Of Capitalism."